heating and cooling contractor to help them with their heating and cooling needs? We get it. Heating and cooling isn't glamorous. It's not high-interest for most people. You should be interested in the quality of the service and equipment, but it is often hard to navigate all the new technology and information out there on the subject. More than anything, you need a company you can trust. 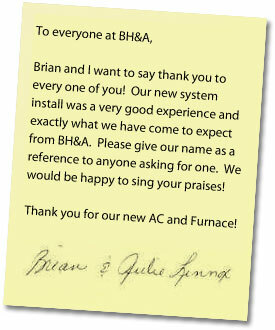 We at Bloomington Heating & Air could tell you how trustworthy we are. We could tell you that we've been serving Bloomington and its surrounding communities for over 25 years and we have a great reputation and do great work. We can say and believe whatever we want, but every heating and cooling dealer pretty much says the same thing. That's why we felt we should let our customers do the talking. After all, most of our work comes from referrals — word of mouth. Take a look at our site and some of the positive customer testimonials we've received through the years, and then make the decision who you should call to take care of your furnace and air conditioner.